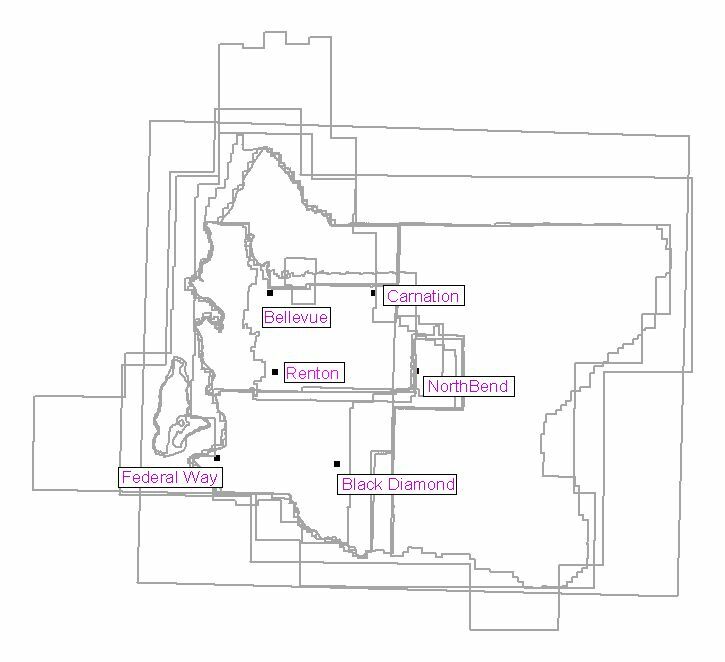 All raster data stored in the King County Spatial Data Warehouse (KCSDW) image library is structured into a standard set of tile schemes integrated with a complementary naming convention. 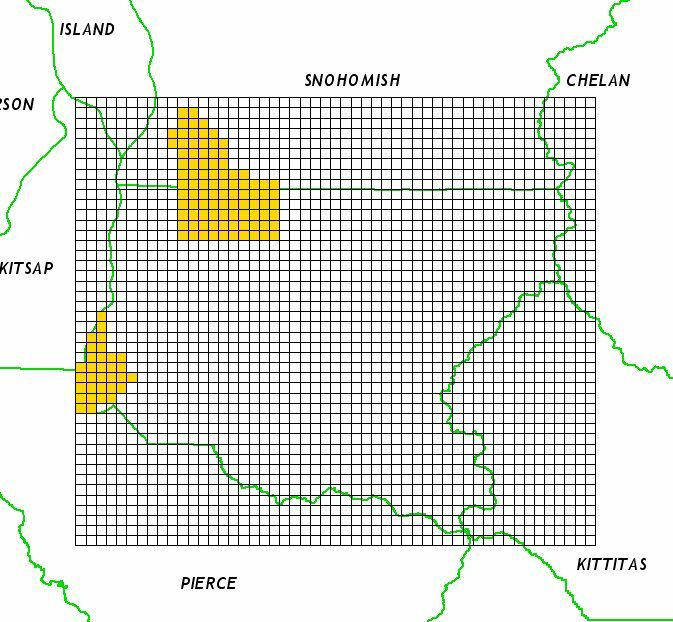 Tiling allows the large raster datasets to be ‘broken-up’ into manageable file-size pieces for use in GIS and other viewing software. For general reference information, see the page Understanding KCGIS Raster Data. Most users will find that data tiled according to the “idxptrmbr” tile scheme, based on townships of the Public Land Survey System (PLSS), will meet the majority of their business needs. This data is minimally compressed (near lossless) imagery or resampled, but densely-posted grid data. This lowest level tiling index is where the dataset is stored in its highest-resolution “building-block” version. Generally data at this level is accessed only for detailed, small area projects or when access to the native data format for imagery is necessary. Imagery at this level is stored in lossless format and other rasters are stored with maximum detail. Where your project area involves multiple townships or where a lower resolution raster or image will suffice, tiles of the idxpzone index may meet your needs. 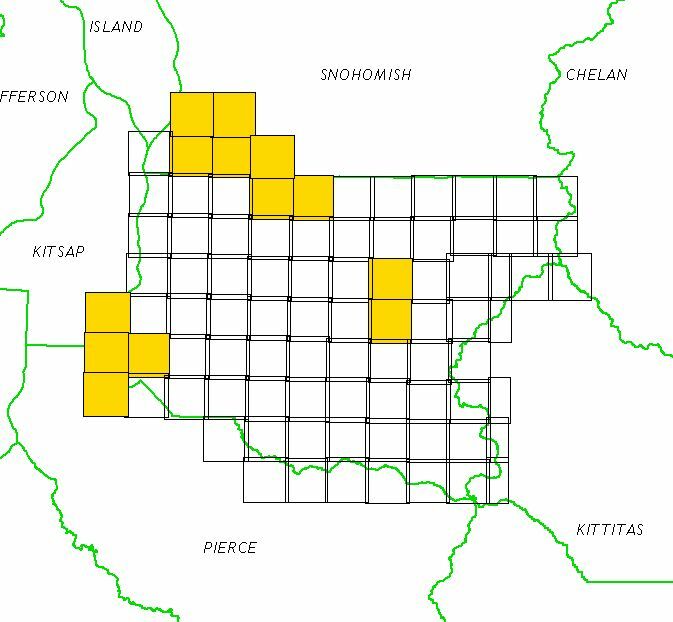 King County and an adjacent buffer area is subdivided into 4 ‘quadrants’ – NW, NE, SW, and SE. Imagery at this level will be compressed, thus reducing its resolution, but making access more efficient. Likewise, other raster data will be resampled to reach an effective sample density/file size median. For a given dataset, all tiles of the data are assembled into a single mosaic/file. The extent of the KeyRegion file will vary depending on the original extent of the component data. Data will be of significantly reduced resolution to accommodate file size limits. 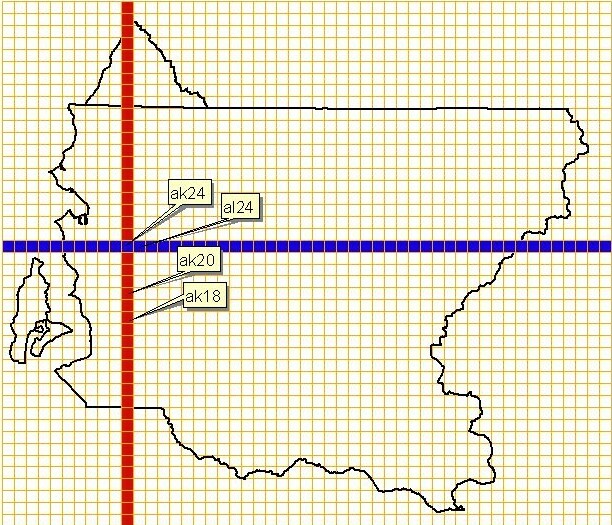 However, the single file per dataset is useful for illustrating county-wide areas and as a quick reference for determining an area of interest. KeyRegion bounds are not really an index, but will vary depending on the dataset described, thus there is no metadata for this storage level. See the metadata for the dataset itself for its extent description and other information. A naming convention established for all enterprise image and raster data complements the tile scheme. It uses standard file descriptors that help you identify your dataset of interest regardless of which tile level you are using. For more information, see "Understanding KCGIS Raster Data." The raster and image datasets in the KCSDW vary considerably in their extent, or in other words, the area that they cover. 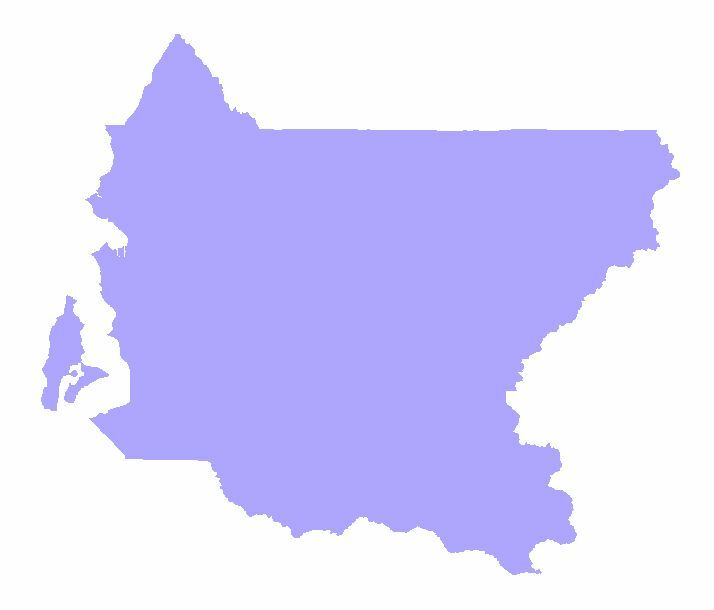 Loading a large image or other raster dataset to your GIS or viewing software, just to see what area it covers, can be time consuming. 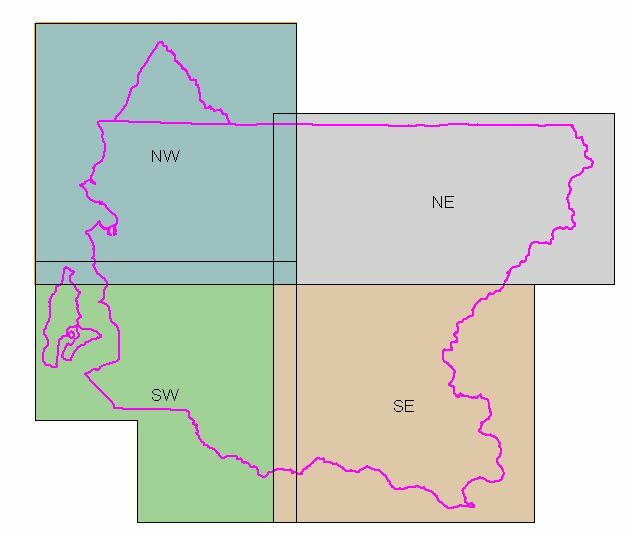 To determine if a data set covers your area of interest internal users can view and query an ArcView shapefile called allextents.shp available at \\gisdw\kclib\plibrary3\extents. The individual polygons that comprise the allextents file are also available as individual shapefiles by dataset. As the image library is reorganized and populated with data tiles, two other shapefiles called raststat_7500.shp and raststat_trmbr.shp can be viewed and queried. 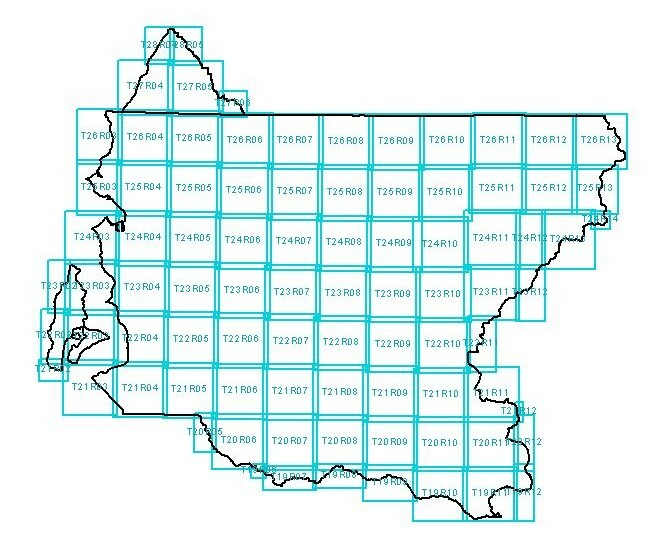 Use these to determine whether a given tile of raster data is available for your area of interest, or to see the entire list of raster data tiles (image, lidar elevation, landcover) that are available. Internal users can find these shapefiles at \\gisdw\kclib\plibrary3\status.